I can’t believe another year has passed since last year’s fundraiser. My girls, Olivia and Victoria, just turned 12 and we are getting ready for tomorrow’s fundraiser breakfast. As part of this fundraiser, the kids serve everyone breakfast and Santa even stops by for a visit!! All proceeds go to the Competition team to help defray costs for costumes and competition fees. Create Dance Center is a wonderful environment for young dancers. Not only do they learn ballet, tap, hip hop, jazz, etc; but they also stress the importance of being a good person. They teach the kids to respect others, how to look out for one another, and they also have them participate in charitable events where they raise money for different causes each year. The dancers also get the opportunity to student teach the smaller kids and the classes held for children with special needs. It is so important for kids to be able to appreciate all that they have and to help those less fortunate or in need. I am very thankful that my girls dance at Create Dance Center, and I am so appreciative for all of the added life lessons they receive. In addition to the breakfast and a visit from Santa, families are encouraged to bring in a basket that can be raffled off. I, of course, made a card basket 😀. So this year, my basket includes 35 cards, 15 assorted tags and a pillow gift box. 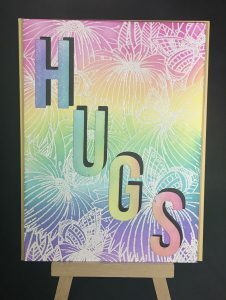 I love making all different types of cards and I even had some help from Victoria and Olivia too. It is going to be hard to list all of the various products I used, so I will list out the companies instead and try to include some of the designers too. I love to use materials from different designers since they each have their own style and there is so much out there today. I’ll be posting all of the individual card pictures on my Instagram page if you want to take a closer look. Sizzix; The Stamps of Life; Stephanie Barnard; Tim Holtz; Altenew; Crafter’s Companion; Sara Davies; Elizabeth Craft Designs; Anna Griffin; HSN; My Favorite Things (MFTStamps); Simon Says Stamp; Papertrey Ink; Lawn Fawn; Taylored Expressions; Darice; Concord & 9th; Zig Kuretake; Imagine Crafts; Tombow USA , We R Memory Keepers, Spectrum Noir, Lil’ Inker Designs, Neat and Tangled, Jen Long, Copic Markers, Pink and Main, Diamond Press, Queen and Company, Karen Burniston, HoneyBee Stamps, and Our Daily Bread Designs, and Spellbinders. I hope you enjoy looking at all of these cards, and if you are in the neighborhood, please stop by to see us!! Happy Crafting!